Combine the unit with other units. The counter is available in different colors. W 61 x D 44 x H 96 cm. Slimline Counter Till block with recess at the top for adding a till. The unit comes with 1 adjustable shelf and 1 drawer. Combine the unit with the other slimeline units and create your own counter. The counters are made of 18 mm. thick laminated chipboard with plastic edging. The counters has a compact design to save floor space in the shop. 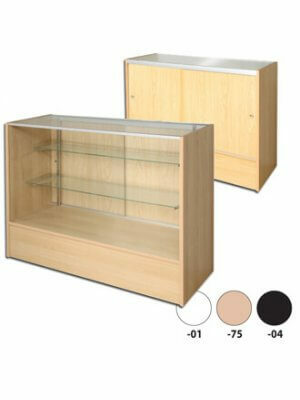 Slimline counter units comes flat-packed for self-assembly.